We have been getting drenched with much-needed rain the last couple of weeks so I’ve not been able to make it out to the vineyards. Between not wanting the car to get stuck, the mud sucking off my boots (it’s happened! ), nor wanting my camera’s electronics to get wet and ruined…I’ve happily stayed where it’s been nice and warm! I’m the type of person who’d much rather be hot than cold, so I’ve not been complaining. Well, the vacation is over! 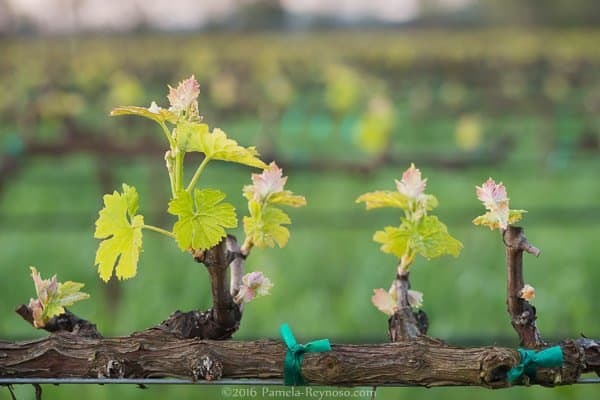 When I was last out at the vineyards in Suisun Valley, tiny buds had formed on the Merlot grapevines, with perhaps a half-formed leaf to a bud. There wasn’t much to look at. This morning, when there was finally enough light to see I was happily surprised to discover beautiful new leaves fringed in pink and teeny, tiny grape clusters. In fact, there are grape clusters in this image you can see on the tallest sprig of leaves to the left. The grape cluster is towards the very top, nestled between the upward pointed pink-tipped leaves and the yellow/green leaves just below them. I have loved sunrise since I was a child, and today it’s no different. (Well, ok, I’m just more tired as I have children who don’t especially like to go to sleep by the time I want them to!) The beautiful soft pink in the leaf tips which is mirrored in the early morning sky makes me smile. May your day be filled with beauty!